Good morning everyone, I hope you are all well. We are trying out a new internet gadget today, something to do with 4G. Our internet is slower than the old 'dial up' used to be. It was okay when we first moved here, but something happened last Summer and we lost the broadband for a day or so and when it came back on it was pants. I have tried to get BT to sort it, but they just keep saying we are within the range of their promised speed. Just lately it seems to have got even worse and no sign of the promised Superfast Broadband, lots of cabling etc around the area, but it was never finished. So, we have this new thingy and I have to say WOW, it really works. So, on to my card for this week. This was a card I made for a really good friend of ours who also happens to be the breeder we got our Majik Beardie from. As you can see I wasn't shy of using embellishments on this card, a bit different to my last one. So, that's all from me. 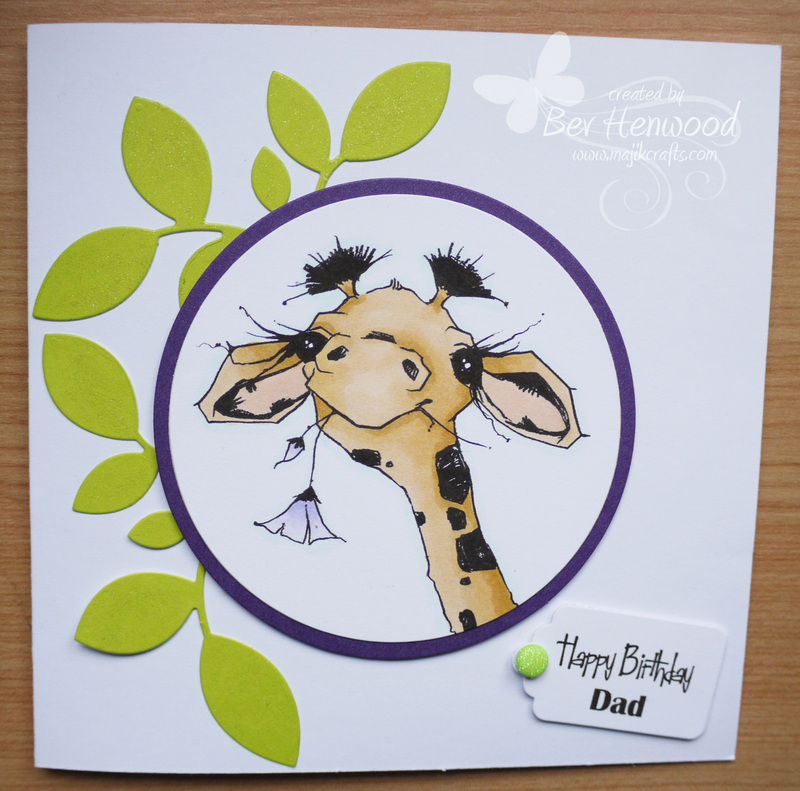 I am off to play on the super whizzy broadband, maybe even visit a few card blogs! Thank you for stopping by and for any comments you may leave. As promised a new card to post, well new to my blog, but made a while ago. As I have been feeling a bit down, my card making has been affected as well, my mojo had well and truly 'left the building'. So, any cards that I made were pared down as I really didn't have the patience to create anything elaborate. This one was for my Dad's Birthday. I adore this image, those eyelashes! As you can see I loved doing the colouring, it was like therapy, but when it came down to making the card I failed in the embellishment department. Having said that I quite like the way it turned out in the end. 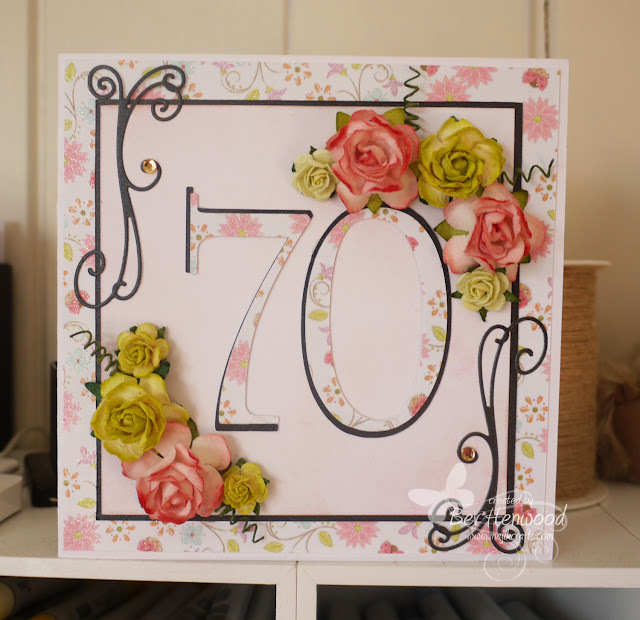 So, note to self, always write down what you have used to make a card, it has taken me forever to remember what was used on this card and looking at some of my lovely fellow card makers blogs, I need to be a bit more 'artistic' with my photos. That's it for this week, hope you are all well and if there is anyone still following my little blog, any comments you make are always gratefully received. I have been MIA for a very long time, I have to admit to have been in a 'dark' place for some time. On Christmas Eve (24th December 2017) in the early hours of the morning we lost our Bearded Collie Sorrell. She had become withdrawn from the rest of the family in the weeks before and was practically living in our bedroom full time. At about 3am on that morning she woke us wanting to go out, we have a veranda outside our French doors from the bedroom (our bedroom is on the ground floor, it is an upside down house), she went out and did her business then collapsed. We got her inside and she had very laboured breathing, I got dressed thinking we would need to get her to an emergency vet, but events took their own turn and with one last huge gasp she was gone. She was fourteen and a half. Christmas, as you can imagine, wasn't great. We were on our own this year and that was probably for the best. I struggled after New year, with all the problems we have had with the house since moving, trying to keep it all together, at one point sobbing down the phone to my Stepmom that I didn't want to be here any more. I was extremely fragile and anyone who knows me would say I am strong and always see a way through, not this time. Then in a cruel twist of fate we lost Bailey our beautiful Beardie Boy. The week beginning 19th February he started really struggling to get up, we had rugs everywhere as our wooden floors were quite slippy. Hubby went to work on the Monday morning and wasn't due home until the Friday (a usual occurrence as he works away from home full time). During the next 48 hours Bailey became unable to get up at all and I was having to help him with a towel under neath him to support him, at this point he was still eating and drinking and going outside for his toileting. I spoke to hubby and we decided this couldn't go on, so I had to make that call and phoned the vets, arranging for them to come to our home, as Bailey hated the vets surgery, no wonder he had been so many times in his lifetime, I arranged for them to come Saturday so Hubby would be home, Bailey was very much 'his boy'. By Friday evening when Hubby got home, I was in shreds, Bailey was very ill. So, on Saturday 24th February exactly two months to the day after we lost Sorrell, Bailey Boy gained his wings, he was two weeks shy of his 14th Birthday. The grief was immense, I was numb, I couldn't do anything, just getting through each day and almost wishing there wouldn't be another one to follow. 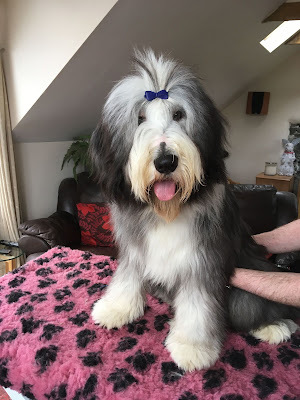 Then one day in April I was scrolling through my Facebook timeline and this picture of a Bearded Collie popped up and it was one of my rescue contacts, Shirley who runs Beardies In Need, posting that this was an 8 month old Beardie Boy looking for a new home through no fault of his own, who had been returned to his breeder. I showed the photo to hubby and he said 'I think you should get him'. After a couple of messages and a phone call we got in the car and drove across the country to near Hull (we are in North Wales) and collected our new Beardie Boy. It turned out that I already knew his breeder (the Bearded Collie world is a very small one) and even stranger still it turns out that this breeder had supplied the first foundation girl Beardie to the breeder we got Bailey from all those years ago, so Merlyn and Bailey are related somehow, it was definitely meant to be. He was called Bobby, but the breeder didn't like that so she had been calling him Dobby, we didn't like either so changed it to Merlyn! That has to be the best decision we have made ever, Merlyn has mended our broken hearts, he is a big fluffy, bouncy clown, I had forgotten what it was like to have a Beardie puppy, it being 11 years since getting Majik. Sorry for such a long blog post, but if there is anybody still hanging in there with me (doubtful), then I felt I needed to explain. I quite often stumble across someone's blog to find they haven't posted anything for a very long time and I wonder what has happened. I am going to try and post something at least once a week and hopefully get some people interested in my blog again.